By now, many people are aware of which technical skills are required for a Data Scientist, but do you know what mindset or thinking is required to be a good data scientist? Let’s read this two parts series by an industry expert. Over the past few months, various people have been asking me to give them an end to end view on what it entails to be a data scientist. When I was contemplating on this request I thought,rather than just providing an end to end process, lets go a little deeper into how she or he thinks when confronted with an analytic problem. So from this week we are starting a new series called the “The Mind of a Data Scientist”. The name of the series might ring a bell to many of you due to its similarity with Kenichi Omhae’s famous book ” The mind of a strategist”. Well the name of the series is inspired from Kenichi Omhae’s book. However the similarity ends with the name. 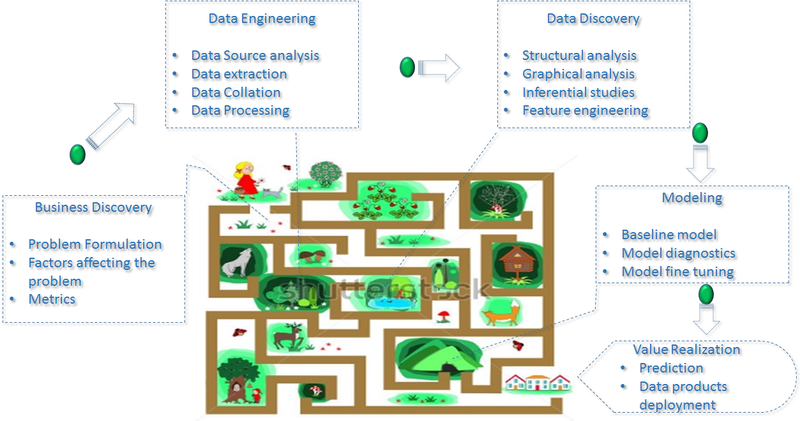 The path we would tread when trying to unravel the thinking process of a data scientist is as depicted below.